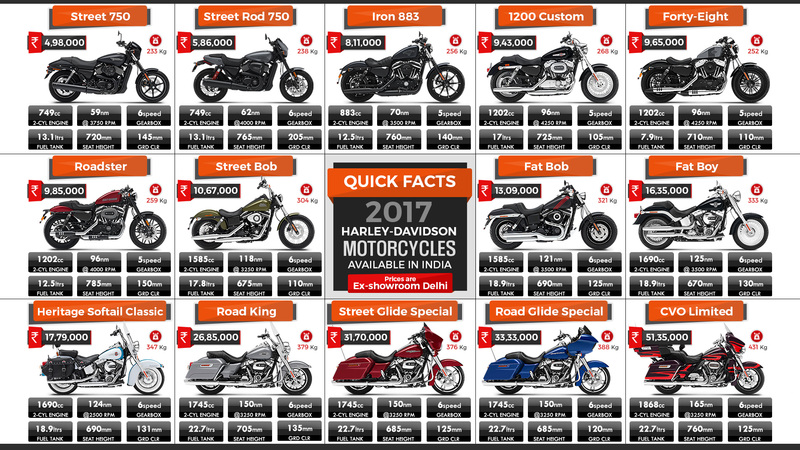 Harley Davidson is the most selling premium motorcycle manufacturer in India. They are strictly into the cruiser department but sometimes come out with products like Street Rod for a wider approach to its fans. They are currently selling 14 models under the 2017 lineup, most out of which are CBUs while some are even locally produced or assembled for effective pricing. The price for the range starts at INR 4.98 lakh (Street 750) while goes up to INR 51.35 lakh (CVO Limited). The engine sizes on the Harley Davidson motorcycles vary between 749 cc to 1868 cc, all of them being twin cylinder for perfect cruiser style riding. The highest selling model on the list, HD Street 750, is powered by a 749 cc, twin cylinder engine producing 59 Nm at 3750 rpm. It weighs 233 kg and brings the best in class riding position in its segment. The most expensive motorcycle (CVO Limited) weighs 431 kg and produces 165 Nm at 3250 rpm. Harley Davidson offers seven different engines across in lineup, most out of which are tuned in two different low output and high output versions. Every motorcycle in the locally assembled lineup gets an option for dark custom parts while Harley Davidson even charges separately for the color options. Click here to know more about Harley-Davidson motorcycles.